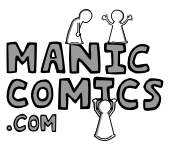 I will be giving away a free maniccomics.com cup to a lucky liker on Facebook as soon as I reach 200 likes and again at 400 likes. I just Liked it!!! Cup is mine!!! Muahahahaha! I “liked” you before, but now I like you even more. I double like you! Look up above. I was the 1st comment & the 1st liker. I liked before too. The cup is mine, mine, mine, mine!! !